Main dealer or independent for older car maintenance? Using a main dealer for servicing is almost a necessity with a new car, but as models age the tendency to move to cheaper independent garages increases. It might come as a surprise that one in six owners of ten year old cars still uses a main dealer for servicing and maintenance then, despite the extra cost and the lack of manufacturer warranty protection. According to a study by Warranty Direct 16% of people who own ten-year-old cars still use main dealers for servicing. With newer cars – even those out of manufacturer warranty, the number is higher at 37% for those with three-year-old vehicles. Overall, across all three-to-ten year old cars, 22% use main dealers despite the increased costs, according to the Warranty Direct study. One in six of 10 year old car owners (16%) still use main dealers to service their cars despite having to pay a significant premium in labour rates. 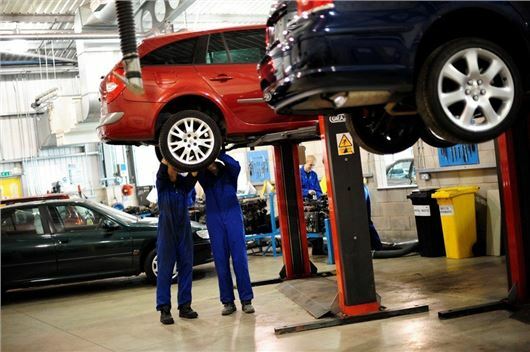 That figure more than doubles for drivers of three-year old vehicles – often just out of manufacturer warranty – with 37% choosing to have their car looked after by a franchised workshop, according to a new study by Warranty Direct. By brand, Lexus, Porsche and Mercedes-Benz owners are most likely to take their vehicles to franchised premises with 58%, 54% and 49% respectively choosing main dealer workshops. By contrast, just 10% of Fiat owners and 11% of Vauxhall owners have the same inclination. Warranty Direct offers owners of out-of-warranty cars the option to extend their warranty, covering the cost of unexpected problems. The table below shows how loyal owners of major makes and models are to their franchised dealer when their warranty period has expired.